The Fireweed Suite, located on the lower level of Camai Bed and Breakfast, provides handicap-accessible lodging features for your Anchorage, Alaska travels. The suite is accessed via a private-entrance ramp from the off-street parking area. Once inside, this spacious suite offers plenty of room for maneuverability with eat-in kitchenette, sitting area, bedroom and private bath. The door frames are at least 30 inches wide, and the telephone, light switches, and thermostats are within reach from a wheelchair. When guests are unable to climb stairs to the inn’s dining room, Caroline serves them breakfast in the suite. The kitchenette offers a sink and appliances, which are within reach of a person in a wheelchair. 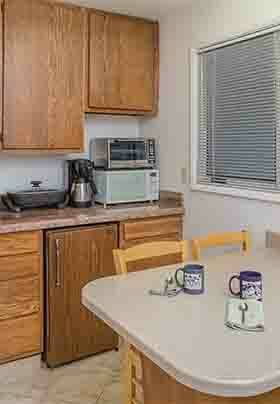 The kitchenette is equipped with a microwave, refrigerator, coffee maker, toaster oven, and set of dishes. A desk/counter with four chairs offers in-room dining options or workspace/game space as needed. The sitting room features a queen-size Murphy wall bed with a comfortable standard mattress. Satellite TV and a DVD player are mounted on the wall for entertainment options without sacrificing space. Choose a title from our large selection of DVDs available to our guests. 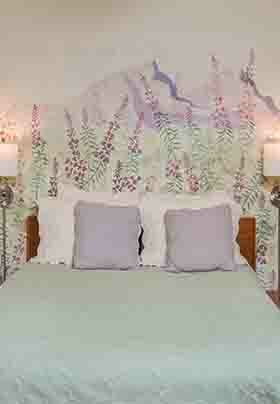 In the spacious bedroom there is another comfortable queen-size bed. In the closet, the rod is at a lower height so that guests in wheelchairs may easily hang their clothing. All of the windows in the sleeping rooms have black-out window shades. The private bathroom features a bathtub with regular showerhead (which can be changed into a hand-held showerhead) and three grab bars. A shower stool with transfer board is available for accessible needs. The toilet is height approved for accessibility. There are additional grab bars. The Fireweed Suite comfortably accommodates two couples traveling together, if they are willing to share the Fireweed Suite’s private bathroom. Wi-Fi is available throughout the suite for guests to check e-mail messages.